Cat “Alpha” Zingano of Broomfield, Colorado, United States and Megan Anderson of Gold Coast, Queensland, Australia were two of the four female mixed martial artists who competed at “UFC 232.” It was the final event of the Ultimate Fighting Championship for 2018. Featuring 13 MMA bouts, “UFC 232” took place at The Forum, Inglewood, California, USA on December 29, 2018. Zingano faced Anderson in the seventh bout of the evening. Born in Gold Coast on February 11, 1990, Anderson is training out of Glory MMA and Fitness in Lee’s Summit, Missouri, USA. She is the former Invicta FC Featherweight Champion. “UFC 232” marked Anderson’s second UFC bout. In her promotional debut at “UFC 22” on June 9, 2018, she lost via unanimous decision to Holly “The Preacher’s Daughter” Holm of Albuquerque, New Mexico, USA. Born in Winona, Minnesota, USA on July 1, 1982, Zingano has been competing professionally since 2008. She is a Brazilian Jiu-Jitsu purple belt and the first female fighter to win via technical knockout in the UFC octagon. “UFC 232” marked Zingano’s sixth UFC bout. She was coming out of unanimous decision over Marion Reneau of Visalia, California at “UFC Fight Night 133” on July 14, 2018. 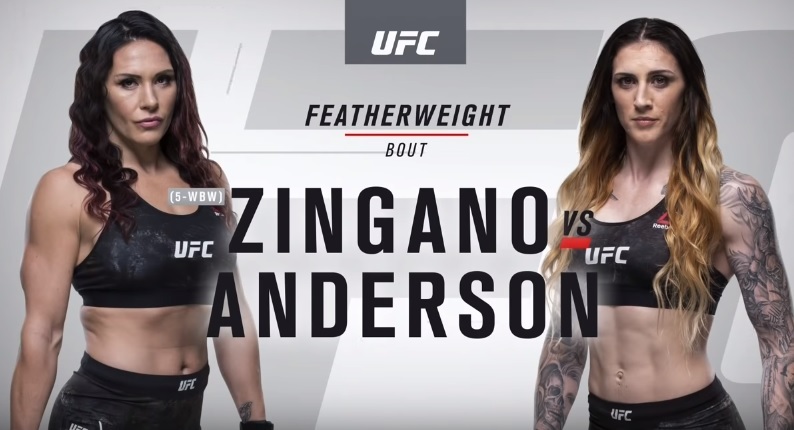 Zingano and Anderson competed in the women’s featherweight division. Referee Marc Goddard put a stop to the contest at 1:01 of the first round when the Australian contender knocked out her American opponent via eye injury. Winning at “UFC 232” improved Anderson’s professional MMA record to 8 wins and 3 losses. It was the fifth time she won via technical knockout. On the other hand, Zingano now has 10 wins and 4 losses. It was the fourth time she lost in the UFC octagon.